Of course most of us don’t have the time to properly tidy up our home. Too much work, too many obligations, and the last thing we think about is folding the socks or dusting. But then, after a while you start to write yourself messages in the dust of the coffee table, you can’t find that other sock no matter how hard you look. And that’s when you realize your house has become crowded with your clothes, magazines, shoes, dust and Henry the spider weaving his web in the corner. Well, it’s time to roll up your sleeves and do something about the mess so you and Henry can continue to coexist in a more serene, healthier environment. Don’t be afraid to get dirty, be afraid of the dirt. Cleaning a home is not for the squeamish. You have to get your hands dirty to make your home sparkle. First things first, make a plan. Divide your home into sections - by rooms or by tasks, whatever’s more convenient. And then write down tasks necessary to clean each section. Then go to the store and buy all the necessary cleaning products and accompanying equipment, such as a mop, gloves, cloth and sponges. 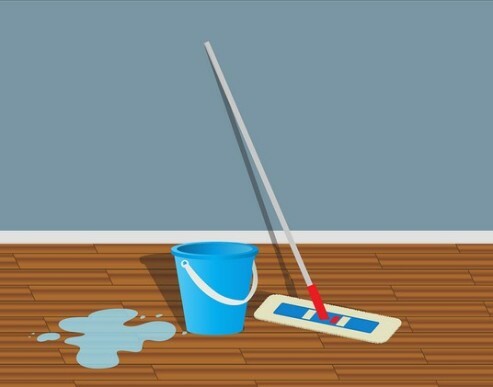 In case you have furniture or technical appliances which should not be exposed to cleaning agents or will get in your way while you clean, think about leasing a storage unit or using someone’s basement. Nowadays you can find supercheap storage with loading services included, so you can save your muscles for cleaning those tiles with a toothbrush (just kidding, a sponge will suffice). Do you really need those old skinny jeans? Look at your closet, open up all those kitchen cabinets, take a peek in your drawers, magazine stacks, shoes in various boxes (and around the house) – the time has come to say goodbye to some of the excess stuff cluttering your living space. So, take a deep breath, take a box and pick a starting point. This is the time to give away, throw away or sell, or all three, everything you haven’t used for a year, and have even forgotten you own. And don’t worry, it’s been the age of skinny jeans for a few years now, soyou can buy new ones as a reward for a cleaning job well done. Organise yourself in order to organise your stuff. It’s totally okay to be a little bit messy, but disorganised is a completely different thing. If you apply order in tidying your place, soon you will experience the benefits of a well organised home. Use storage boxes, clothes hangers and vacuum bags to put away your stuff. As you’ve experienced it first hand, cleaning the house is an exhausting and time-consuming task. But if you organise all your things now, and keep that order, later you won’t have to slave away with the mop so much. It’s all about setting a routine and sticking to it. Pat yourself on the back for doing a good job. The floor is shiny, the drapes smell like lilies of the valley, you can see through the oven door again, and Henry is so happy that he started weaving the word “Brava” in his web. But what will happen tomorrow, or next week? Will you respect yourself and the work you’ve done, or was all this effort for naught? Think about it, you can spend several minutes a day to tidy up your place, or several hours once a week or month, depends how messy you’ll be, to clean, wipe, dust and scrub. Regular cleaning will save those perfectly manicured nails, or provide time to play a game, watch a movie, have drinks with friends, and still enjoy the freshness and comfort of your home. We vote for the latter. There’s always the option of hiring a cleaning lady if you don’t mind someone going through your stuff, but make sure you know where she folded your underwear or put that pancake pan. But whatever you decide to do, it’s important that you understand that a clean and tidy house will make you feel better, healthier and proud of yourself.